We have to admit that it can sometimes be a struggle to find a suitably interesting slice of London history. Being interesting and engaging is obviously of paramount importance, which is why we often find ourselves hoping that we can dig up something more noteworthy than say, Jeffrey Archer stubbing his toe on a coffee table in his riverside penthouse whilst taking a break from writing another cack novel to get up and get a glass of milk on this day in 1982. Lucan obviously wasn't present at court, having at this point already decamped to Brazil where he spent most days playing cards with Shergar, Martin Bormann and Reggie Perrin. Our favourite theory on the whereabouts of Lucan is that he was mauled to death by a tiger at John Aspinall's zoo, but Lady Lucan herself reckons this is just plain nonsense. Five people are currently on trial in Rome for the murder of 'God's banker'. The scene of the crime has links to P2, the Italian Freemasonic that Calvi was apparently linked to. Members of P2 referred to themselves as frati neri or "black friars". 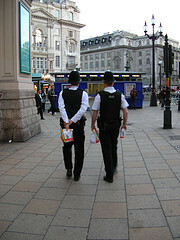 McDonalds used two investigation agencies to collect information on London Greenpeace before writs could be served. At some of the group's meetings there were more 'spys' present than genuine members. The first McDonald's restaurant in the UK opened in Woolwich on October 12 1974 and was the company's 3000th restaurant. Tokyo, Amsterdam, Munich and Sydney got theirs first, but at least we beat the French, who succumbed to the lure of 'le big mac' in 1979. The 1000th UK outlet was opened in 2000, inside the Millennium Dome. Fancy a go at running the McDonald's corporation? Try it out here . Abul Koyair and Mohammed Abdulkayar. The two brothers from Forest Gate caught up in the bungled anti-terrorist raid two weeks ago surely deserve some credit for stepping quickly out of the role of victim and instead pushing hard for some answers, leading a march of 5,000 people that drew from all sections of their East London community. It's still unclear whether the Met or MI5 were more to blame, but if anyone deserves some answers, it's these two. It's got to be Architecture Week really. Certain sections of the Londonist dungeon have been beside themselves with excitement over all the events taking place this week, and have been buidling elaborate and rather large Lego buildings in celebration. They're certainly impressive structures, but if they get any bigger they threaten to get in the way of the football viewing on our plasma screen, which just won't do. Editro will have to be told. Get worked up about watching England tomorrow. C'mon admit it, they're the worst thing about this tournament so far...BOR-ING. Pick up the international vibe and head to De Hems on Wednesday for Holland v Argentina, which should prove to be a stupendous footballing encounter.